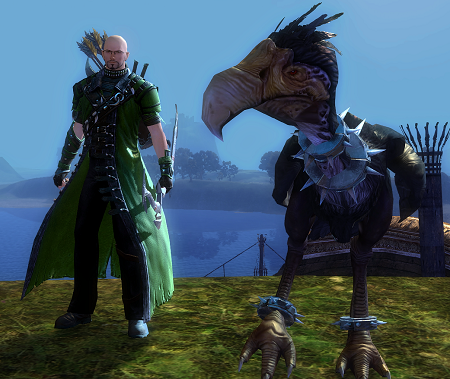 Pet: Argyll (Arr-Guy-El); black moa. If you ever actually look at them, like really take a moment to contemplate everything there is to think about Moas, you're almost guaranteed to realize that they are odd creatures. From their tiny, beady, eyes to the fact that they have a wingspan larger than any human body and yet remain completely flightless... no matter how you look at them, they're some weird critters. And that's exactly what made them Simeon's favorite thing in this world. Simeon spent most of his childhood outdoors, running around in the fields with the Moas, pretending he was on some grand adventure far from their little rural village in the middle of who knows where. Armed with slingshots and sticks, he was ready for any adventure that he could squeeze in between lunch and supper. The number of times the nearby farmers had to warn his parents that he was charging down the road on the back of a Moa, as if it were some form of feathery steed, couldn't be counted. Simeon was always a strange kid, much to the chagrin of his more dignified family members. He wanted to see the world, fight dragons and be the hero of the day; they wanted him to take up the family business. 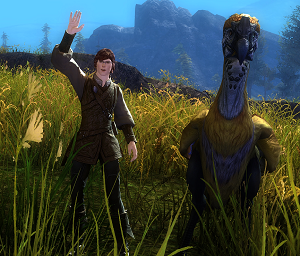 You see, the McLemore family are a proud lot of merchants and smiths, whose ancestry ties back to Old Ascalon. They remain fiercely loyal to their Ascalonian heritage, and never truly integrated into Krytan society. 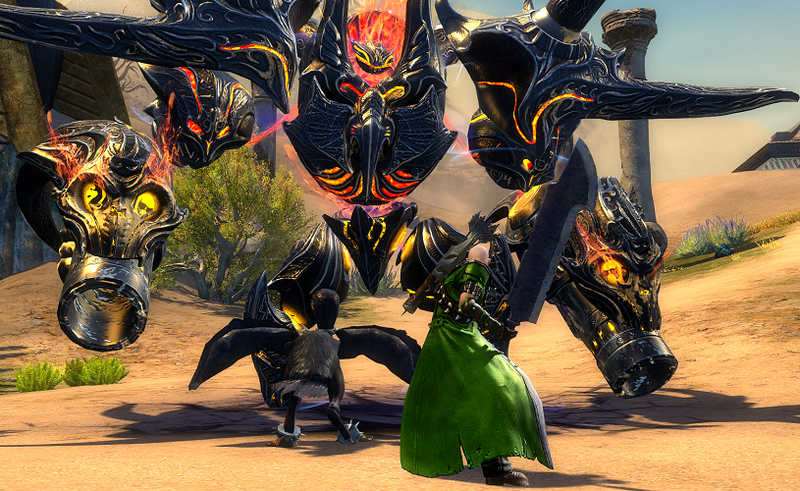 To them, the family's adventuring days ended when Old Ascalon fell. While few items from that history still remain, some did survive: among them were Simeon's many-great grandfather's old sword and bow. They were passed down from generation to generation, often used as decorations above fireplaces. Simeon often told himself that one day would inherit those weapons, just as his parents had and theirs before. But rather than placing them on some mantel to use as talking points, he intended to put them to use once more in a way that his recent ancestors had not: he was going to be an adventurer! While he wasn't entirely sure what that entailed, he was, at least, very certain that it somehow involved a Moa. Now, as a young man in his early 20s who had never really left his hometown before, Simeon wasn't exactly an adventuring expert. One thing did seem pretty clear, though: he wanted to do it and it was dangerous, so if he was going to survive out there then he needed someone to teach him how! Unfortunately, there weren't many options for training in this rural landscape, so he'd need to relocate... most likely to Divinity's Reach. Being the human capital, there was no shortage of adventurers and trainers from whom he could glean information and find work, so it was the perfect place for a newbie adventurer such as himself to make his start. The journey itself would be relatively safe since the roads were used often, and were well guarded by seraph, so he packed up what little he planned to take, said his goodbyes and set out! 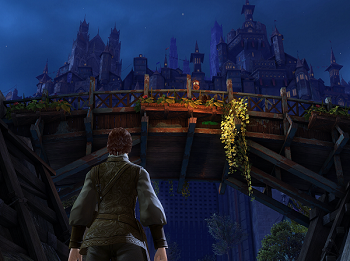 Simeon will likely always remember the day that he first arrived at Divinity's Reach. He had heard tales of the city, but little will prepare you for just how large it is up close. Standing at the gates, looking up at the towering wall and the houses that lined across it, really put into perspective just how massive this place truly was. The gates themselves looked large enough that a full size dragon could walk through... or so he assumed, having not actually seen a dragon before. Despite however awed he may have been, he had no time to stand around and gawk; he had made it to the human capital and it was it was time to get down to business. The first thing he needed to do was track down a bow, and a trainer to teach him how to use it; if he was going to get anywhere, he needed to learn how to hunt and fight! Unfortunately, it turned out to be much more challenging to find a trainer than he thought it would. Everyone was so busy with their own business that they scarcely had time to train some country bumpkin with skills that he should already know. Still, he wasn't giving up that easily. For months he sat in bars and pubs, meeting with travelers and hearing their stories. Once in a while he would broach them for tips or tricks, and even went so far as to ask some to train him (for fair pay, of course). Some of them took him up on the offer, meeting up the next morning to show him the basics of how to wield his bow and his sword, or how to properly defend himself from an attacker. The training was a bit of a mess, all things considered; dozens of people, with well honed skills from all sorts of backgrounds but without any cohesive vision, giving him one day lessons before moving on and leaving him to his own devices. Each one of them fought in a different way, and not all of them agreed with what he had been taught by those who came before them. Still, he felt as if he were learning. During each day he would either try to find work or would train, either by himself or with a hired mentor. Each night he would go back to the pubs to start over again. It had been over a year since he had arrived at Divinity's Reach, and his training was going well. Despite the unorthodox method of learning, the constant practice and variety of instruction was helping him improve quite a bit. Thanks to this, he began to find himself being hired to assist the very adventurers who had once been his teachers. His days were now spent going on various quests near the city, and slowly he found himself feeling more and more comfortable dealing with dangerous situations. 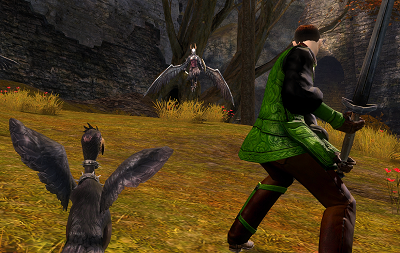 The jobs were often simple, fighting off bandits or stopping harpies from harassing nearby merchants or towns. Still, they were far more than he could have handled just a year before. Each evening, after the quests were complete, he would return to the training grounds near the city to practice some more. Every day was consumed with some task or errand, and Simeon couldn't help but feel that adventuring was turning out to be a lot of work. Sure, the people who hired him were happy for the help, and many of the merchants and townsfolk nearby were beginning to recognize him. It's not that the work wasn't paying off, but just that he had always imagined it would be a bit more... glamorous. Still, deep down he knew it would be worth it in the end. There was one thing about all of this that did really bother him, however: he still didn't feel confident to go into the fray alone, and so he always tagged along with a more seasoned adventurer. He wanted to go out on his own, not be some lackey to a person he met at the bar a night before. In truth, what he really needed was a partner; someone that he could fight alongside, to have his back and stand with him when things got tough. So far the bars and pubs weren't turning up anyone who seemed like they'd make for good long term company, but maybe one day that would change. Perhaps it was fate. Perhaps it was luck. Or perhaps it was simply the fact that he had gone walking through the Moa fields every day for the past year that caused him to eventually stumble across the very solution to the problem he had been struggling with. Of course, it wasn't entirely the solution he was looking for. 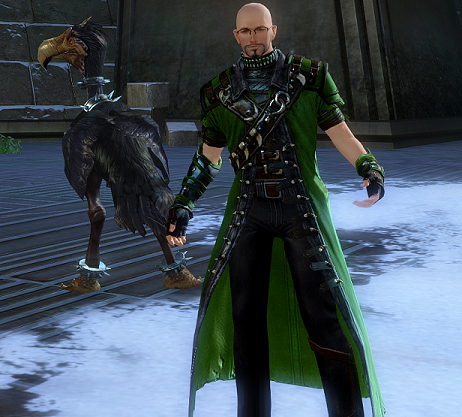 Long ago, as far back as the days of Old Ascalon, there had been a... fad, if you can call it that. Someone had the bright idea to take a black moa, a relatively rare bird with black feathers and red eyes, and deck it out in the most ridiculous spiked collars and anklets that you could imagine. The result was something that could only be described as a bird demon with an attitude. Of course, the practice had long since fallen out of style, and the rarity of black moas in the wild made it even less common still. The point is: you're very unlikely to ever actually see such a thing walking through the woods on a regular day. So, with that in mind, you can imagine poor Simeon's response when that's exactly what happened to him. This might well have been the most ridiculous thing he had seen in his entire life. This tiny young bird, black as night, looked like something out of a nightmare. A tiny nightmare. No matter how much he laughed, it just continued to remain funny. The bird seemed a little less amused with the outburst, but all the same stuck around. Since Simeon often fed the Moas on his walks, he generally kept a small bag of feed on hand, which he chose to share with the poor misfit of a creature. This seemed to be exactly what it was hoping for, as it gobbled up the offering with gusto. For such a small bird, it certainly had an appetite... possibly from lugging those little metal circlets around all the time. Having amused himself thoroughly with his strange discovery, Simeon set back off towards the city, only to realize the bird was following him every step of the way. He didn't mind much, as he was rather fond of Moas in general and this one certainly took the cake for originality, so he chatted with it as they made their way through the trees. It showed neither interest nor disinterest in his ramblings, merely staying close at his heel and peering up at him from time to time. The young adventurer and his new companion eventually arrived at their destination, and after a few failed attempts to shoo the critter away at the gate, he reluctantly accepted that it would be staying with him overnight. It took some copper to convince the innkeep to let the tiny moa stay in his room, but eventually the pair was able to retire for the night, the moa sleeping comfortably at the foot of the bed. Simeon's new companion had changed things a little. Training now involved not only his own skills, but also teaching the mini battle bird as well. It seemed to pick up new concepts quickly, which made his life much easier; it would stay and run on cue, and could dish out gnarly pecks and kicks when necessary. The adventurers who hired him were often reluctant to let him bring his "pet" along, concerned that it would slow them down, but more often than not he was able to haggle them into agreeing. At first the bird would watch them fight, sitting safely on the sidelines. In time, however, it began to charge those who attacked Simeon, delivering tiny and ferocious little pecks at their ankles or torsos whenever things got tough. Thanks to the newfound backup, Simeon began to find himself feeling more emboldened to take on jobs of his own. The townsfolk knew him, and his skill with the bow and sword had improved enough that he was able to hold his own in most situations. With the bird at his back, he no longer had to rely on those travelers. The partners continued this life for a while, relaxing around in the nearby townships in Queensdale during the evenings and working through various tasks during the days. Their successes had built Simeon's confidence, and the work had certainly filled his purse. No matter how you looked at it, he had become a proper adventurer, albeit a small time one. Still, he had accomplished what he came here to do. With his goals in Divinity complete, it was time to take the next step in his grand plan: to return to his family and retrieve the artifacts that were rightfully his. Or so he had thought. As it turned out, Simeon had been gone from home for so long that his family got tired of waiting for him to come back. Being as they were traveling merchants, and no one was left to tend to the house, they opted just to sell the whole thing and put everything they didn't need to carry around with them into storage... including Simeon's sword and bow . 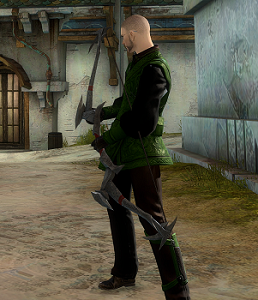 The weapons' new home was a bank vault in Lion's Arch, so that was where he was headed. He booked passage on a boat from Kessex Hills, and hit the seas! 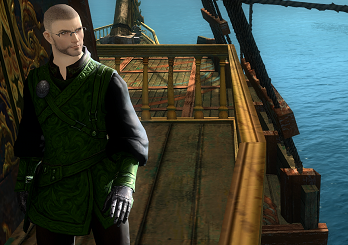 In case you were curious, Moas do surprisingly well on boats. While he had expected the worst, the little black bird, whom he had recently named Argyll, seemed rather unphased by the rocking of the boat or the crashing of the waves. Of course, this didn't hold true to the adventurer himself, who spent most of journey trying to keep lunch down while wondering why he didn't just walk. He promptly categorized boats under the list of "never again" items that seemed to be growing larger by the day. After what seemed like an eternity, they finally arrived in Lion's Arch. 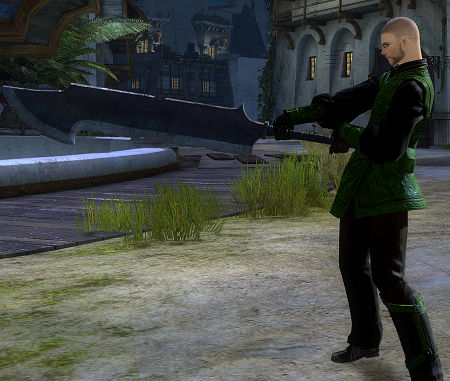 Many years ago, the McLemore Fellblade was a majestic weapon. Light refracted upon its surface, creating a colorful sheen which truly belayed the power that was imbued into the metal. Time, however, had not been kind to it. The body of the sword was beaten and battered from use, and the magic upon it had fouled. Where once a beautiful light had danced across its blade, a dark smoke now poured out. Despite this, it still held a much greater power than any other weapon Simeon could hope to get his hands on. And hands, plural, is exactly what it took to lift that sword! While his ancestor, a warrior monk of very large stature, had wielded it with a single hand, it took Simeon both hands just to hold the thing. There was some suggestion that perhaps said ancestor was part norn, or at least that's what Simeon kept telling himself. The Ithas Longbow was slightly less impressive, though still an amazing weapon. 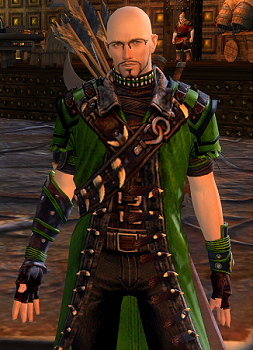 The design was one no longer found in either Kryta or Ascalon, and the materials used in its creation were unlike anything else that he had ever seen. It was sleek and smooth, an almost malleable metal that felt durable and yet flexible at the same time. It was very light for something so large, and it was obvious that the body had been designed with agility and defense in mind. The quality of this weapon had not degraded like the sword; in fact, by way of imperfections he could find none at all. With the two artifacts now in his possession, and a faithful companion by his side, Simeon was ready to begin the adventuring career he had dreamt of as a child. 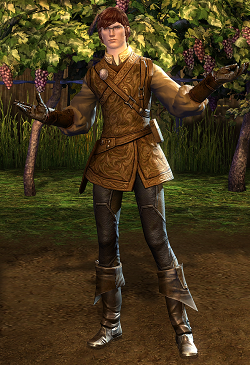 Sure, he had done odd jobs and quests around Divinity's Reach, but the world was a big place. Bandits and harpies were only the tip of the proverbial iceberg, and there were a lot more things out there that people needed help with. It was high time he got to it. 10 years is a surprisingly long time when each day is filled with some new and exciting adventure, but this tale is long winded enough as it is. The short version is that Simeon and Argyll traveled from city to city, shore to shore, looking for adventure wherever they could. There was no rhyme or reason to their travels, or to the work that they took. Some of it was glamorous, some was not. Argyll grew a little, and Simeon found a new style. 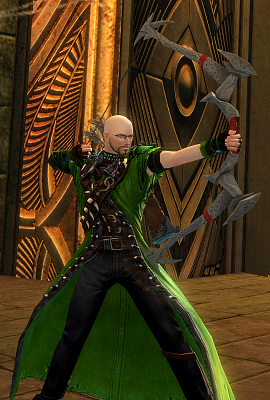 The glasses were still a thing, unfortunately; being farsighted doesn't really lend itself to archery without them. From time to time they still return to Divinity's Reach, and frequent the same pubs where they got their start. Sometimes they travel there looking for work, sometimes to help new adventurers in need, and other times just for the nostalgia of it all. Despite everything that they had accomplished so far, there was still so much more world out there to see, and they were just getting started. Until they could honestly say that they had "Been There, Done That" to everything the world had to offer, they wouldn't be staying in one place too long. And, honestly, they wouldn't have it any other way. Simeon is an oddball. No way around it. He spent most of his childhood surrounded by miserly and pragmatic merchants, in a rural area of farmers and moas. There wasn't a lot of outlet for his energy, and he made up for that with his own ingenuity... mostly involving causing problems for other people. As he's gotten older, that hasn't really changed a lot, though being an adventurer has helped. He's generally a pretty upbeat guy. 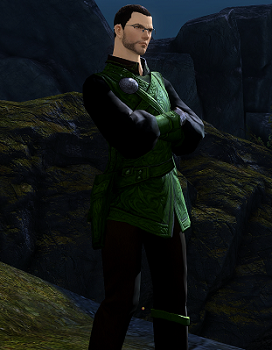 Most of his adventuring focus is on helping other people, and taking quests that would assist those in a tough spot. He's basically the kind of person that, if possible, would be willing to help with just about any problem that someone comes to him with, no matter the danger. He's not a big talker, and can be a bit awkward at times (remember that most of the time his primary conversation partner is a giant bird), but he means well all the same. If you have troubles and need someone to accompany you, he's definitely up for being your guy. I got involved in RP with my first character, Joe. Unfortunately, I work a pretty time demanding career, so I overestimated my ability to play at the time and ended up having to take a hiatus from the game for a while. This time around I've got a bit of a better grasp on my situation, so I'll be able to actually really get involved in the community and with the character. As I said the last time I wrote one of these: I've been playing MMOs for a looooong time, but I've never really done much more than just watch RPers do their thing. All of this is still pretty new to me, so please be gentle. My general windows for getting on, if I am able to, are between 7:30pm - 11:00pm EST. I will sometimes log in and just hang out in one of Divinity's pubs while I do other things; if you see me just hovering and randomly doing emotes, its me trying not to get booted for being AFK. Feel free to come up and chat if you see me. I won't log on if I can't stop to talk, so just assume that if I'm online, I'm open for it. If I don't respond, you may have caught me at an unlucky moment of running off to get something to drink, so feel free to just hit me up with a whisper. You did a really good job with this profile! It was super fun to scroll through and I can tell you put a lot of time into it and taking the screenshots that showed how the character changed over time. It's a really unique approach and I appreciate it lots! I love your character profiles, man! Welcome back! I tend to not be able to be around until close to when you're logging off for the night (RIP timezones) but i'll keep an eye out for you and maybe (hopefully) catch you around some time! Hah! Thanks, I'm glad you like 'em! On weekends I'll likely be on a bit longer because I tend to make poor life choices that catch up with me Monday morning and can only be resolved with copious amounts of coffee, so we might run into each other every once in a while!